Jazz out of SWOSU is making the rounds. Southwestern Oklahoma State University’s Jazz Ensemble ‘A’ is currently working its way around the state of Oklahoma on a special tour. The group has planned a special finale concert Friday evening at the Oklahoma Jazz Hall of Fame in Tulsa. The concert at the Jazz Depot, formerly known as Tulsa Union Depot, will be held at 7 p.m., and the public is invited to the free concert. Other concert stops include performances at Kingfisher and Stroud high schools. The depot is not only a concert venue but also hosts the Oklahoma Jazz Hall of Fame, which includes such Oklahoma raised jazz greats as Chet Baker and Charlie Christian among others as inductees. Joining Jazz ‘A’ on their tour is Oklahoma City trumpeter and SWOSU alum Kirk Palmer. Palmer, one of the most in-demand trumpeters in OKC, is a regular on stages throughout Oklahoma. 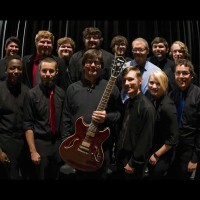 The tour continues, in a manner of speaking, throughout the weekend with Jazz Ensemble ‘A’ and ‘B’ performing at the 2015 Miss SWOSU Pageant on Saturday, November 7; a concert on the SWOSU campus on Sunday, November 8, at 3 p.m. in the Fine Arts Center; and concluding in Stillwater on Monday, November 9, at the Oklahoma Jazz Educator’s Fall Workshop. The Tulsa Jazz Depot is located in downtown at 5 South Boston Avenue in Tulsa.